Artists, it is often said live in a world of their own transferring dreams on to canvas. But those seeking realism in theirs get closer not only to their subjects but also to connoisseurs and admirers alike. There exists artists of different kinds who are not versatile and whose work changes very little. Among the painters who are the subjects of these changes are those who are versatile and modest. Such an artist is Basil Cooray. Born in Uswatakeiyawa and educated at Uswatakeiyawa Maha Vidyalaya and Gonzalez College, Pamunugama, Basil is a self-made artist. He had received guidance under well-known artists such as Douglas Paul, Dominic Cyril and Stanley Abesinghe. From time to time Basil painted landscapes with frank and tasteful felicity with the medium of water-colours and oil to represent Sri Lanka's rural life. Beautiful as many of his pictures are in which so much of the subject is described by a few delicate, precise lines, some of them enclosing sober monochrome washes, others simply areas of virgin paper or canvas. The splendour of the smiling hills with streches of luscious green paddy fields, the haunting natural beauty of the village became a powerful and lasting influence to provide artistic stimulus to his life. He had a individual style of painting landscapes. He continues to be inspired by the various cultures that he encounters resulting in the creation of quite a few masterpieces. THe older he grew the more skilful he became not only in the mixture of his colours but also in the texture of his design. The intensive search and experiments from time to time has resulted in a succession of landscapes done by the use of his finger (not by brush). The occasional flick with the finger in a damp wash can be quite effective for sunlit grass or branches or thatched hut. Basil has exhibited his works at the National Art Gallery, Colombo, the Lionel Wendt Art Gallery and at the Hermitage Gallery. He has also participated in several group exhibitions: Young Contemporaries (1997, 1998, 1999), Moods and Modes, Nawa Kalakaruwo (2001 and 2002) and Images of Peaceful Life (2002). 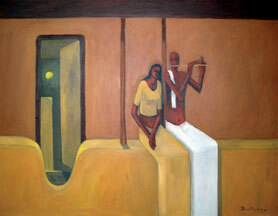 He has also participated in the International Artist Camp 2002 and 2004 conducted by the George Keyt Foundation. Basil's paintings adorn reputed institutions such as the President's House, the Hatton National Bank, the Central Bank of Sri Lanka and the Embassy of Sri Lanka in South Africa. Down to earth, simple and sensitive will be an appropriate description of his personality and character. His art never suffered from the sunset of an outlived inspiration. On the contrary like good wine, it has improved with age.